Unlike most of my friends, I’ve never been a big fan of the horror genre, both movies and video games. There are certainly exceptions (well, mostly the Dead Space franchise), but for the most part, I steer clear of horror games. I’ve seen most of the Alien movies, but was never hooked to them. After the incredibly mediocre Alien: Colonial Marines that came out last year, it seemed like Alien fans were doomed to live with average game adaptions of the horror series. After my fifteen-ish hours spent with Alien: Isolation, I feel confident in saying that it’s the best game to date, by a landslide. 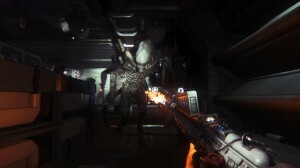 Most of the time developers seem keen on making games that allow you to murder alien scum, in Alien: Isolation, it seems like developer The Creative Assembly have wanted to give the aliens some payback. I couldn’t tell you how many times I died while playing Isolation, but I know it was a lot. I mean, a lot. For someone that’s been known to rage quit, it’s a testament to how much I enjoyed the game that despite how much I died, I couldn’t stop playing. 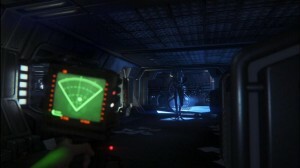 The story of Alien: Isolation is set fifteen years after the events of 1979’s Alien and forty-two years before 1986’s Aliens. Amanda Ripley is determined to find out what happened to her mother Ellen Ripley. Amanda is dispatched to the Sevastopol to try and recover the Nostromo’s flight recorder and shed some light on her mothers disappearance. Naturally, she gets there to discover the alien has decimated the stations crew. For the most part, the Sevastopol plays its part as a solid location for the story. With its dark corridors filled with glitching lights and electronics, air ducts and dead ends, it’s a great area for you to explore. Isolation frequently produces the gut-wrenching sensation of carefully sneaking around one last corner, build you up in thinking you were done, only to come up against a locked door and face the realization that you are going to have to retrace your steps. Oh how I loathe you, Sevastopol. For the most part, the game matches the tone of the movies. You’re given a consistent feeling of dread, without going overboard on gimmicky horror moments. The alien AI is beautifully constructed and if you’re not careful, he’ll start learning and predicting your movements, making the difficulty almost impossible at times. You’ll really have to take your time and be methodical if you want to survive each portion of the game. We played the Xbox One version with Kinect enabled, which, when allowed (you can toggle them off/on), will track your head movements and any sounds you make. While the head movements didn’t seem to make too much of an impact, my dogs growling at each other in the corner of the room caused my death many times (damn you Brouwer and Lucy!). We assume those will also be available for PlayStation users who have PlayStation Move. Aside from the alien AI, I’d say the best aspect of Alien: Isolation is how it kept the feel of the movies. As soon as the game started, you were treated to an eerie score, VCR tracking special effects to simulate those nostalgic visual issues when your VCR would skip and then you’d get tons of Easter eggs throughout the campaign. If you’re a big fan of the series, the game is a must play. While you’ve got the main campaign, you’ve also got survival mode, which requires players to escape from a level while completing various tasks all while beating a timer too. Needless to say, it’s very challenging. As of now there’s only one map and one playable character (Amanda Ripley) but The Creative Assembly have stated they’ll be releasing more in the future. 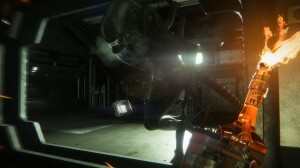 While Alien: Isolation is not without its faults, it does a great job not only paying homage to its source material, but carving a unique area for itself as well. 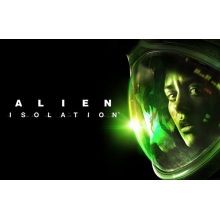 For those who aren’t a big fan of the horror genre, Isolation may not be worth your time, but if you love feeling like every step is going to be the one that gets you killed – Alien: Isolation is certainly for you. Between the decrepit and maddening Sevastopol and the aliens AI, you’ll want to pull your hair out and punch anyone within reach, but the feeling of accomplishment when you actually manage to outsmart the alien is very rewarding. Alien: Isolation is out now on Xbox One, PlayStation 4, Xbox 360, PlayStation 3 and PC. + Homage to the Alien series - both audio and visual. + The Alien's ability to hunt you. + Tons of ways to attempt to outsmart the Alien. - Awkward pacing at times.